This is one of the worst things I've ever seen. I'd say that's hilarious, but who the hell has the money for a weeklong meditation retreat? At first I read that as "masturbation retreat" and I was confused why that would cost all that much. Yeah, but who has the time for that? Plenty of time for a masturbation retreat when you're underemployed. Now let's just kill golf. Look, if I knew we were going around killing golf courses I'd have signed up to be on a death squad. I missed the memo somehow! Let me know when we kill pay sites. Somewhere, George Carlin is cackling. We've already killed memos. Now it's all peer-to-peer communication. We're still working on it. Isn't it used to counteract the effects of hard water? Writing sympathetically about how a giant megacorporation has the sad is the most WSJ thing. Doesn't it make your towels worse? That's what it does, right? No no, you guys. It turns that little dish in the middle of your washing machine blue and slimy. 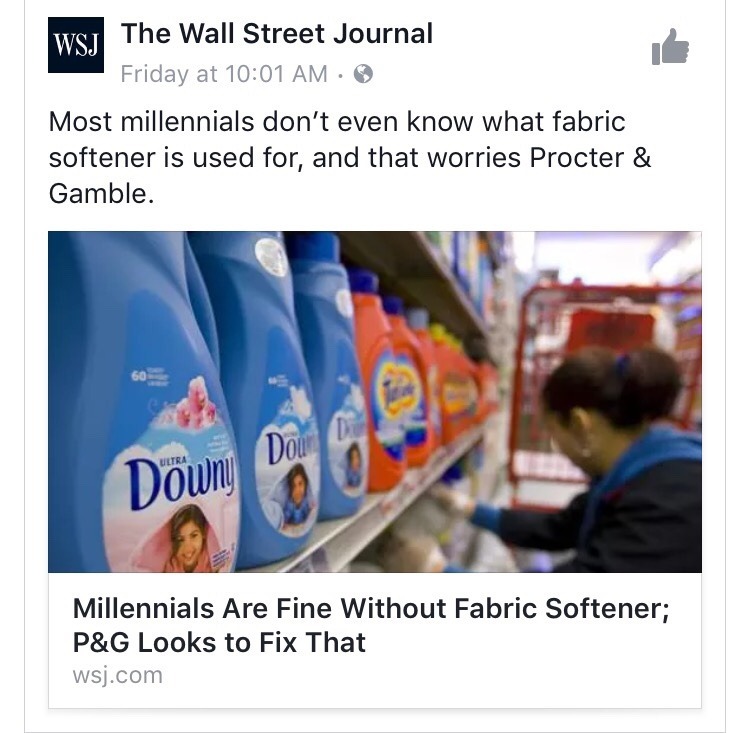 My parents didn't use fabric softener and I'll be damned if I will. Millennials are all bluster right now, but the minute they run up against a mob of Medusas or Cockatrices, they'll be sorry. That's the point, SOFT is passé now that Millennials use Gold Needles on everything. Boy! Did I not tell you to put down your avocado toast and help me fight this minotaur? I just use Bounce sheets, which does both fabric softening (sheets are impregnated with the softening agent that releases when heated in the dryer) and anti-static? It took me too long to realize you didn't mean you use Bounce sheets to fight medusas. It turns out Medusas are only angry because their trousers are too stiff. Typical millenials - wasting their money on avocado toast and Gold Needles. That's not where they keep their snakes, Büge. Are you sure? Have you ever looked inside a medusa's trousers?